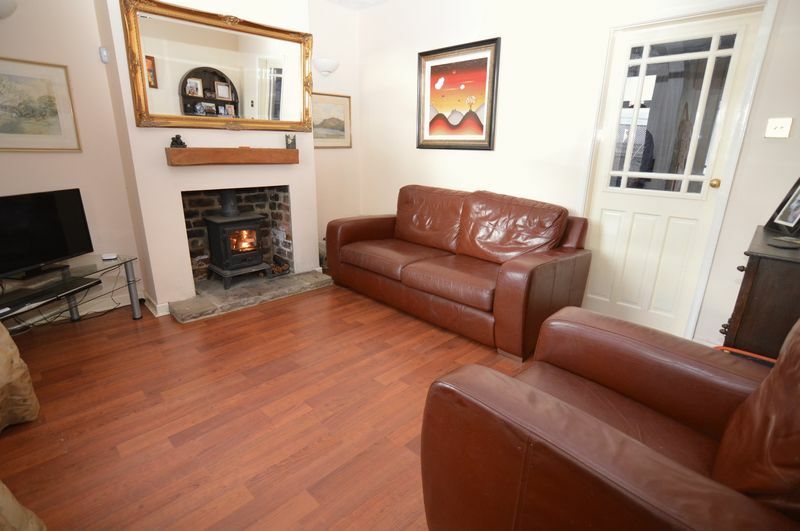 This CHARMING and CHARACTERFUL end terraced COTTAGE offers a cosy lounge with MULTI-FUEL STOVE and open COUNTRYSIDE views. 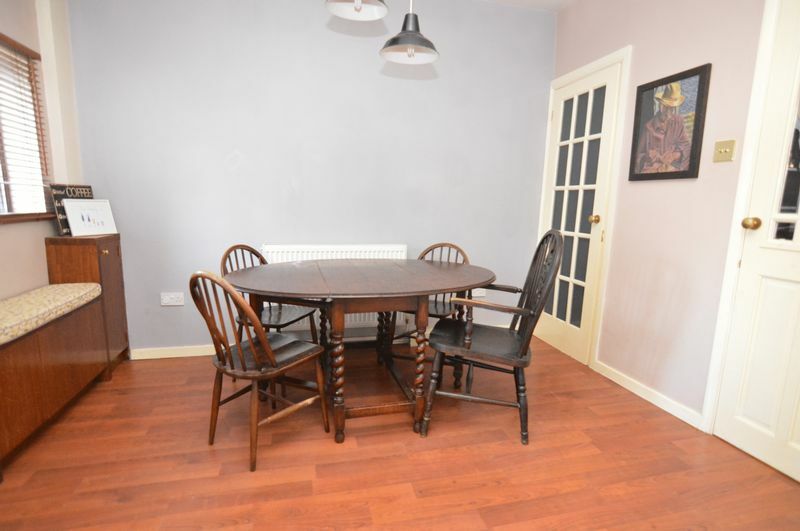 Situated in a POPULAR and sought after residential VILLAGE with nearby SCHOOLS and good COMMUTING links including MOTORWAY access and TRAIN STATION. 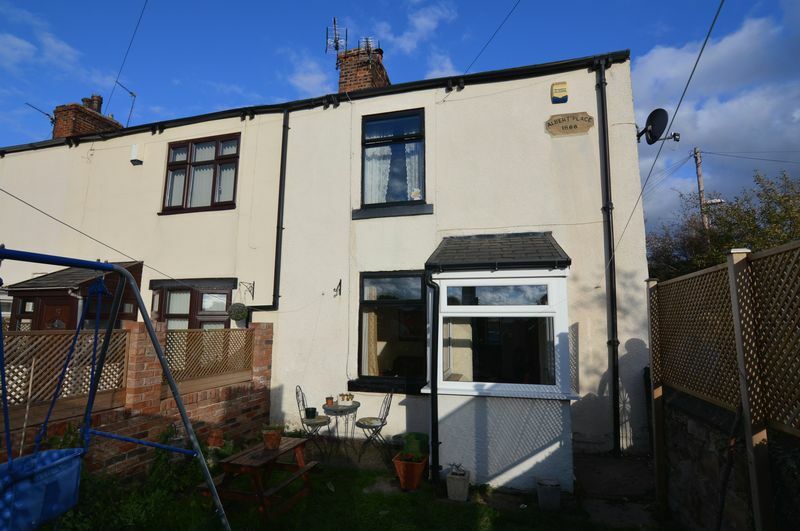 This spacious end terrace cottage oozes charm and character and is situated in the popular and sought after residential village of Methley. The cottage is close to local amenities and within easy reach of the motorway networks for travel to Leeds, Castleford, Wakefield, Pontefract and beyond. 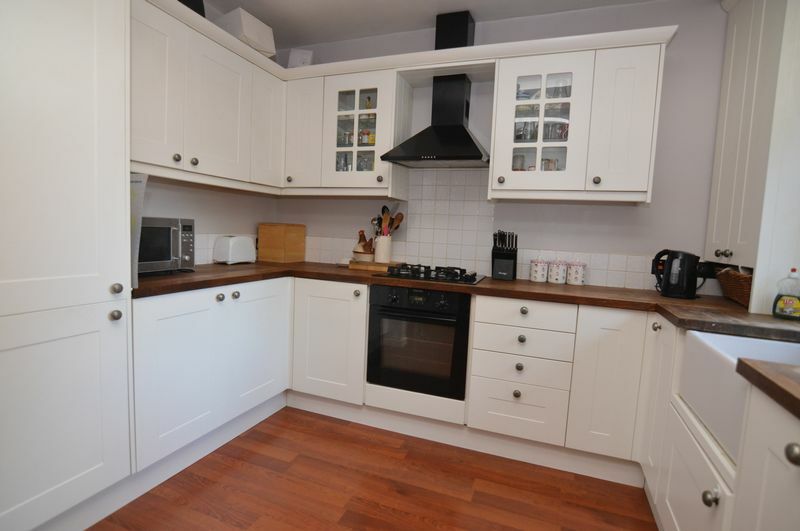 This lovely home is ideally suited for first time buyers or young families alike. The accommodation briefly comprises: two double bedrooms one with a substantial number of fitted wardrobes, a well presented lounge, lovely open plan kitchen area with an opening to the dining area and a modern and contemporary bathroom. 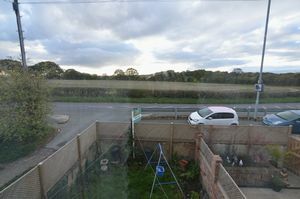 The front garden is private and enclosed by walls and trellis fencing and is mainly laid to lawn. The rear area is open plan and benefits from a parking space with additional parking to the front and side. 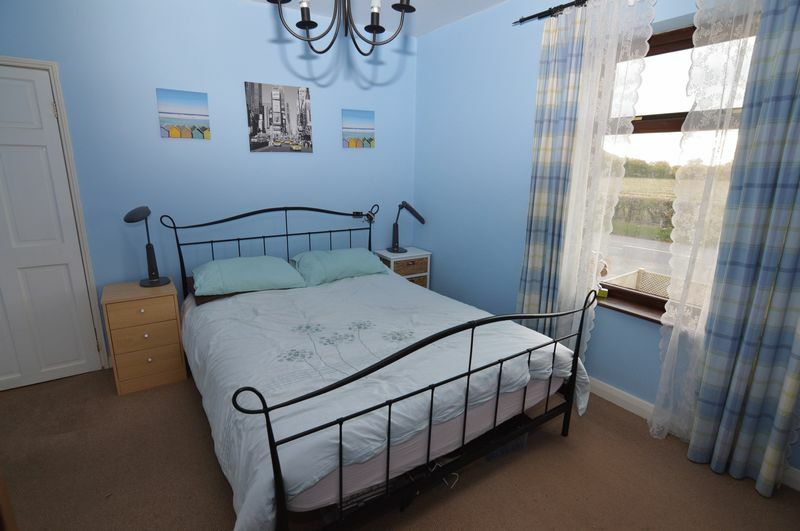 The property benefits from UPVC double glazing and both gas central heating and security systems. A composite door with glazed panels inset opens to the entrance porch which has windows to both sides, mosaic style tiled flooring and a timber door with decorative etched panels leading to the lounge. 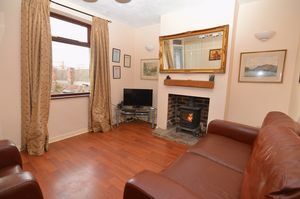 The main feature of the well-presented and spacious lounge is the part exposed chimney breast with multi fuel burning stove inset and feature wood lintel over, there is a window, a radiator, a door leading to the staircase and a door with multi-glazed panels leading to the kitchen / diner. 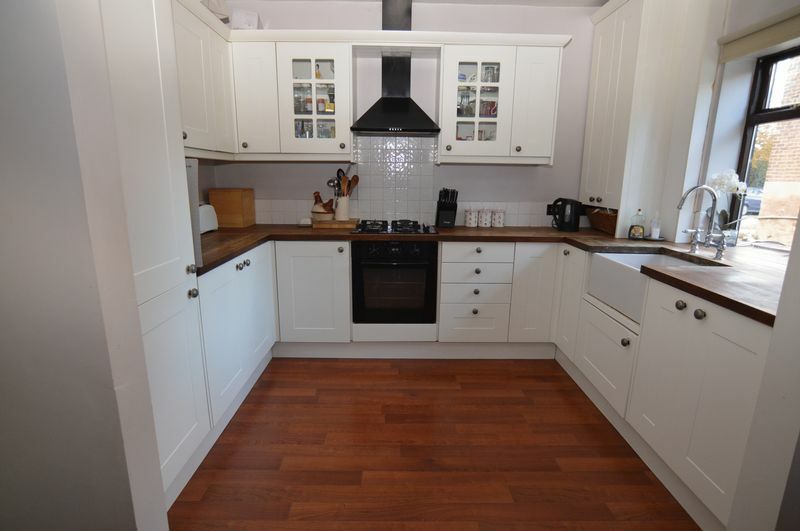 Fitted with a comprehensive range of wall and base units in cream with woodblock work surfaces over, inset with a ceramic Belfast sink with mixer tap over. There is an electric oven, a gas hob with chimney style extractor hood over, splash back tiling, an integrated fridge and integrated freezer, space and plumbing for a washing machine, a window and an opening leading to the dining area. The dining area has a window, a radiator, a door opening to a generous and useful under-stairs storage cupboard and a timber door with multi-glazed panels inset leading to the rear porch. With windows to two sides and a UPVC door with glazed panel inset opening to the rear. 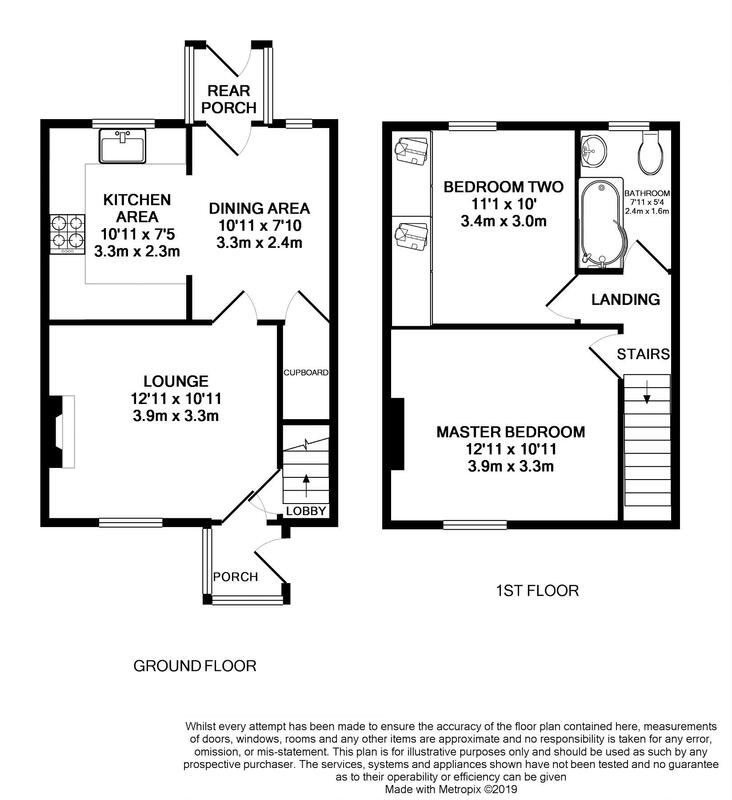 Stairs lead to the first floor landing where an access hatch opens to the loft space, there is a radiator and doors leading to the bedrooms and bathroom. 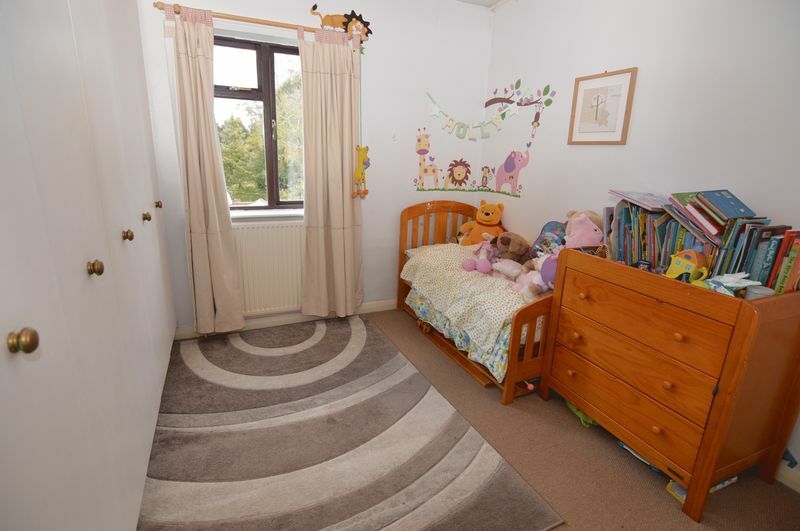 A good sized double bedroom with a window and a radiator. 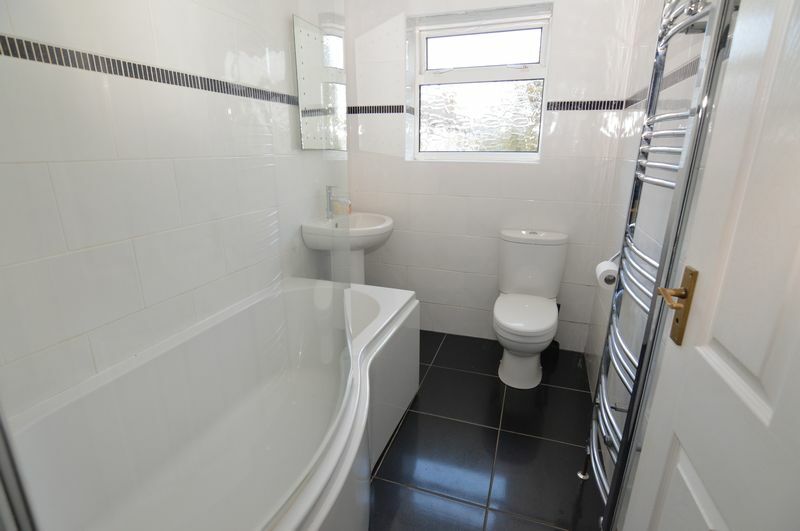 This modern and contemporary bathroom is fitted with a three piece suite in white comprising of a ‘P’ shaped panel enclosed bath with a mixer shower over and a side shower screen, a pedestal wash basin and a closed coupled WC. There is tiling to the walls and tiling to the floor, a chrome effect towel style radiator and an obscure glazed window. Another good sized double bedroom fitted with a range of wardrobes across one wall, a radiator and a window. A wrought iron gate provides access to the private front garden which is enclosed by walls with attractive trellis timber fencing above. The front garden is mainly laid to lawn with planted borders. To the rear the property benefits from a parking space, the property benefits from additional parking to the front and the side.